Smaller high country streams have still been producing over the last week, with a nice still warmish day making the ideal scenario in these cooler streams. Small dries or nymphs are the go here. remember all streams are running well and high so watch your step and be safe. I have attached some photos and a report as you requested. I fished mostly around Buckenderra. Saturday evening was quite good with all the fly fisherman onto fish with the trout showing no real preference to flies. The secret seemed to be to get them down a bit and fish slow. I stayed out and did the midnight shift hooking an absolute monster right on midnight on a cordulid, which I lost near the bank on snag. Sunday was slow with tonnes of boat traffic and lots of fisherman staking out spots on the bank. Got a few hits while fishing really deep during the day but didn’t land anything. The southerly blew up in the arvo and the fishing died with it. Monday morning I was back into fish again but the snags were wreaking havoc again I did manage to land this good brown around 7 am on a bead head tom jones (not sure what it weighed). The fish seem to be in all the likely places, I did find it pretty important to fish on the windward shores though and to muscle the fish as with the lake rising so fast, if they got down they would bury you in a combo of thistles, briar and timber. Thanks again for your help. Having not ever fished the lake outside of winter I found your advice invaluable. What a perfect way to finish a great week the weather was awesome and the fishing FANTASTIC. We had lots of visitors and a lot of fish were caught the majority from the bank. Early morning and in the evening they were biting, sherbet power bait was the popular choice for the weekend and with mudeyes you could not go wrong. Trolling was closer to the bank no reports of any fish caught deep and Tassie devils with pink in them were lucky. Fly-fishing mud eye patterns were used and the largest trout caught was a brown 54cm and 5lb clean. Majority of the fish over the weekend were rainbow between 30-35cm long and very healthy they have so much feed with the lake rising a lot of reports were the fish were full of worms. The lake is at 57.9% and still rising. Happy Fishing everyone and hope to see you soon. My name is Paul McLeod. I am the guy from Canberra who dropped in about 9.00am on Saturday morning to pick up an annual license, some mud-eyes, floats and hooks. Thought I'd let you know how it went - all grist for the mill in your fishing report. 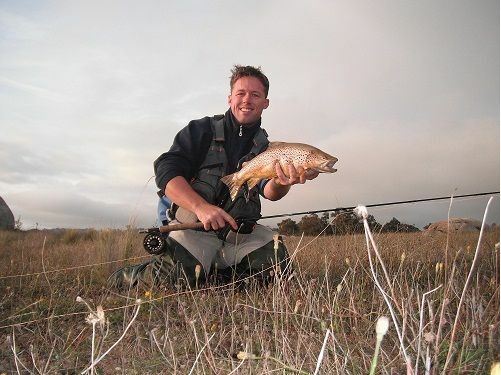 I really enjoyed my first fishing trip to Eucumbene. I went to Angler's Reach about half a mile south from the boat ramp. Started fishing around 10.00am. After the first cast with a mud-eye about a metre under the float you sold me, I set up the rod, and went back to the car to pick up a few things. Came back 3 minutes later and there was a very, very nice fish jumping around at the end of my line. As long as my fore-arm and quite fat too. Unfortunately, he had swum behind a floating log and my line had snagged . Spent the next 15 minutes trying to pull the log in - on a 6lb line. I was making progress, all the time with the fish jumping about on the other side of the log. I nearly had the log close enough to jump it and unsnag the line, and I lost him. Next cast, same rig, hooked up again, but he threw the hook after about 10 seconds. Then things went quiet for an hour, so I decided to move somewhere facing south because the wind was from the north. Went to the little bay near the Old Cemetery near Old Adaminaby. Mudeye under a float - nothing. Tried a few lures - nothing. Then I went to Old Adaminaby about 500 metres west of the boat ramp. Same rig, mudeye under a float. Hooked another nice fish about 40 yards off the beach - around 2.30pm, and landed this one - 2.4 lb thank you very much. Tonight's dinner. After that, it was pretty quiet. One hook up an hour later but the threw me pretty quickly. So, that was it. Lessons for next time? Get fishing earlier, have everything ready to go from the first cast, and think about the wind if you're fishing light tackle off the beach. Thanks again for your help yesterday. See you next time.